Whether it was the irresistibly warm spring day or that it was the first day of school holidays, there appeared to be only a small turnout at the Auckland SCBWI meeting on Saturday. For whatever reason those of us who were there were treated to an interesting talk by Brian of his venture into illustrating picture books and the methods he used. -points of view – from the sky, on the ground, cross view, shadowing to give the view of seeing through a leaf or material. – situations/weather – using bubbled paper to help give the illusion of rain, streaks or splats to give depth. -putting reader in the illustration – magnifying creatures and plants to give you the illusion for example, you are actually standing on the leaf or as a bee. -finishing sentences – illustration shows what the text may have said if it had been completed. As Brian often does full double spreads for his picture books it was important to ensure main details were kept away from the gutter (centre fold) of the book. He pointed out how lines etc can be drawn to ensure that should some of it be swallowed by the gutter there is still enough to see what it is. And of course leaving room for text. 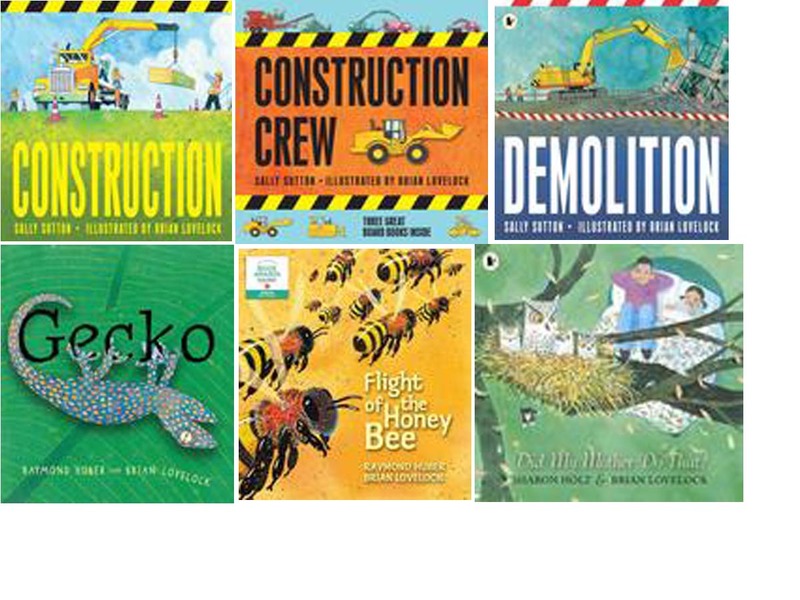 An award winning illustrator living in Auckland, Brian has painted most of his life and only recently moved to illustrating picture books such as Construction, Gecko, Flight of Honey Bee, The Rain Train, Roadworks and Demolition. 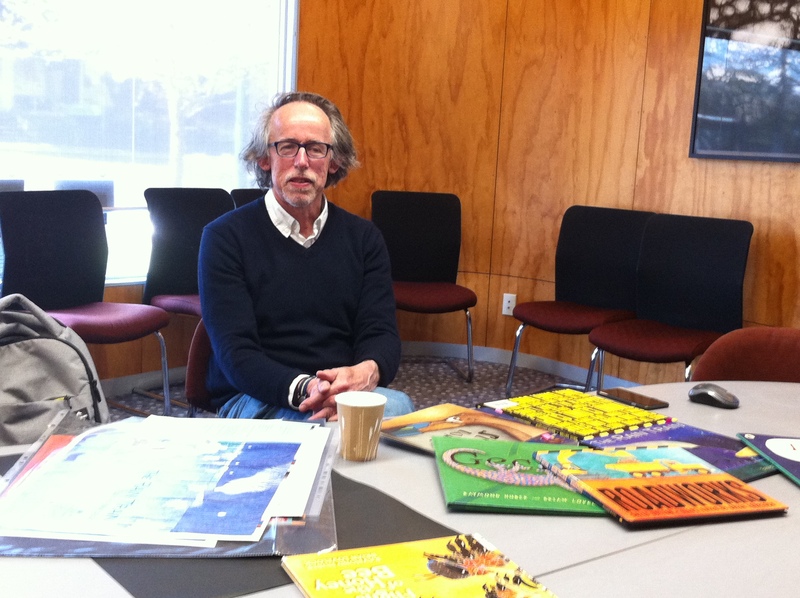 His first picture book, Road Works (written by Sally Sutton and published by Walker Books) won the 2009 New Zealand Post Book Award for Best Picture Book. He likes bold imaginative perspectives and works mainly with watercolour. Brian explained there are some restricted areas or compromises that have to be made in some areas when illustrating a book to be sold internationally, such as not showing a vehicle driving on the left or right side of the road, or text in speech bubbles becoming a problem when translation is involved or any text in illustrations. There is also ethnic and gender balances and health and safety aspects within an illustration such as a playground although made of metal would need to show it as plastic and children to wear shoes etc. It was an informative, relaxing afternoon I always enjoy listening to illustrators explain their creative methods and visions for picture books. Such beautiful detailed work. Below are some of the books Brian has illustrated. This entry was posted in Children's literature, SCBWI and tagged Brian Lovelock, Childrens Picture Books, Picture Books for Boys, Sally Sutton. Bookmark the permalink. Hi Darlene, Yes it was very interesting. Loved this post, Diane. Thank you so much for giving us an inside peek into Brian’s process. And you explained so clearly some of the terms that newer picture book writers might not be familiar with, like gutter. Can’t wait till I am in NZ and can attend one of your SCBWI meeting with you! Hi Vivian. So glad you liked the post. And yes I can’t wait for you to be here also. So looking forward to meeting you. What a fascinating post! I have so much respect for illustrators. I love how he shared the many things that he has to consider, especially when doing a double-page spread. The gutter was new to me. You have such a great SCBWI group in New Zealand. It’s spring in New Zealand and fall is beginning to show here, but our temps have been in the 80s. A front from the west will knock us down to the 60s on Thursday. But, our leaves haven’t fallen yet. Vivian, you are so lucky you get to travel there. Oprah says everyone should visit New Zealand. You are so fortunate. Hi Pat. Yes there is a lot to consider when illustrating picture books. So glad you liked the post. Yes the weather here has certainly got warmer and flowers blooming everywhere. I love this time of year. I’ll be blog posting events as they happen when Vivian is down here. Can’t wait for her arrival. I wish I could have been there! Love listening to illustrators and all their methods of madness!